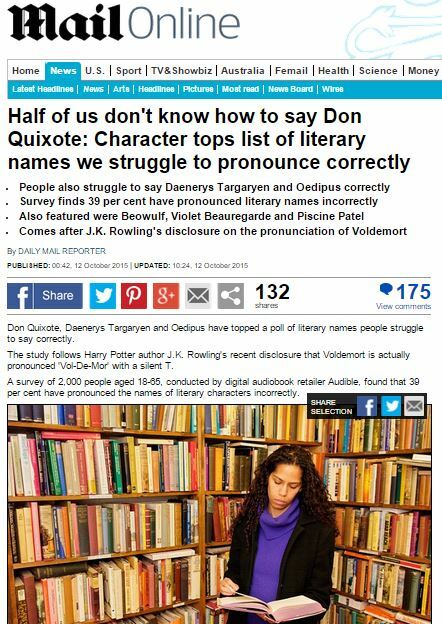 Don Quixote, Daenerys Targaryen and Oedipus have topped a poll of literary names people struggle to say correctly. The study follows Harry Potter author J.K. Rowling’s recent disclosure that Voldemort is actually pronounced ‘Vol-De-Mor’ with a silent T.
A survey of 2,000 people aged 18-65, conducted by digital audiobook retailer Audible, found that 39 per cent have pronounced the names of literary characters incorrectly. Laurence Howell, director of Audible UK, said: ‘Book series such as Game of Thrones include some incredibly tricky names, which readers often get wrong for a number of reasons. This entry was posted in Audible and tagged Audible, daily mail, daily mail reporter, John Sutherland, Laurence Howell on November 3, 2015 by Michael Marshall.